Green and Haines define natural capital as “a healthy and functioning environment [that] provides valuable ecosystem services, such as food, timber, wildlife habitat, flood control, and recreational opportunities, which are essential for human life” (Green, Haines 2012). Vermont is unique in that it has vast forests, mountains, rivers, lakes, and land available for agriculture.The town of Alburgh is a very small one, in terms of both size and population, but it does have a lot of the natural capital that you would see in typical small, lakeside town in Vermont. As mentioned earlier, Alburgh isn’t very big, clocking in at 48.8 sq. miles (29.3 sq. miles being land and 19.5 sq. miles being water). 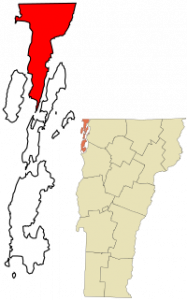 (“Vermont Municipal and Community Website”, n.d.) So, if you were to take a drive around its relatively small perimeter, one of the first things that you would notice is that there is a lot of land being utilized for dairy farming. The farms in town are a part of the St. Albans co-op which is a member-governed dairy cooperative, and community based organization that is committed to providing service, stable markets and the greatest achievable return to its members by delivering the highest quality milk products and services to their customers. (“St. 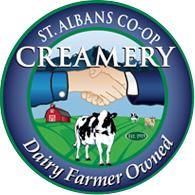 Albans Co-Op”, n.d.) The Cooperative provides active leadership in the dairy industry and political environment to benefit the farmers of Alburgh (and Vermont Farmers in general). Although the majority of the farmland in Alburgh is primarily owned by three families; the majority of grazing lands, corn fields, and hay fields are located along the Eastern perimeter of the town. Most of these farmlands are all surrounded by trees, which is used for both the production of lumber and maple syrup in the town. Although there is an abundance of trees in Alburgh, there are no maple syrup or lumber industries located in town. All of the maple syrup and timber made is solely for personal use by the owners of the land. In addition to the stuff on land, there is also a great amount of water that surrounds three fourths of the town of Alburgh. Lake Champlain is not only a place for families to enjoy a day on the sun, but it is also filled with lots of fish and plants. Most of the fish in Lake Champlain have an abundant population, so over-fishing isn’t a problem yet. People can make money from selling the fish they catch in the lake, or they can use them to feed their family. 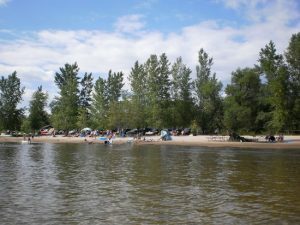 Connected to Alburgh is the Alburgh Dunes State Park, which is one of the most natural and longest beached on Lake Champlain. (“Alburg Dunes State Park”, n.d.) This is a huge destination for local and traveling families during the Summer, and the water is lovely. Although the town of Alburgh doesn’t have a very large variety of natural capital, it makes use of what is has without degrading the environment, and it’s very commendable.